‘Value Added’ is the outcome of extensive research conducted by CEM at Durham University. Their research started over thirty years ago and fundamentally looks at the differences between baseline testing and examination results, the difference between the two being the ‘value added’ by the educational institution. This is a marker for the quality of teaching. We do our initial baseline testing in the Forth Form when pupils join the Senior School. 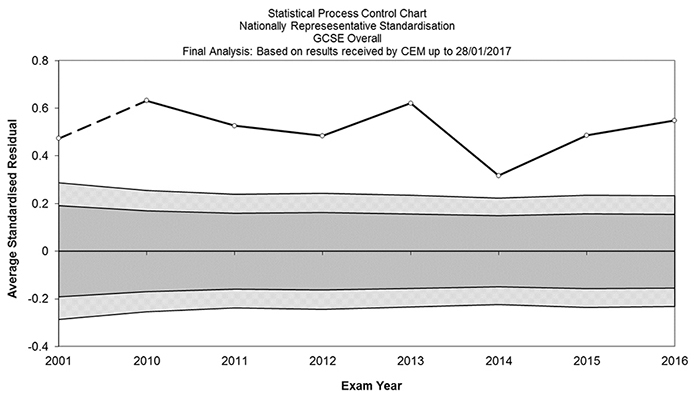 From these tests CEM are able to assess pupils’ likely examination results at GCSE. This is our starting point. Through outstanding teaching and continuous assessment, we are able to help pupils to reach their full potential and this is often someway beyond those early grade predictions. The quality of the teaching at Bishop’s Stortford College is such that we are able to improve, often significantly, the results pupils achieve. Without undue pressure, pupils are inspired and encouraged. Their learning is often self-driven, we are a place where it’s normal or ‘cool’ to study and to work hard. Our Value Added scores are consistently high when rated against other schools in the UK – both state and independent. This is something we are justifiably proud of. You can see our Value Added data for Sixth Form here. In the graph below the black line at the top is our Value Added score. The shaded areas either side of the zero line represent 95% and 99.7% confidence limits. Values above these levels are considered significant and in this case indicates over the past seven years that the teaching at Bishop’s Stortford College has added significant value to the performance of our pupils.